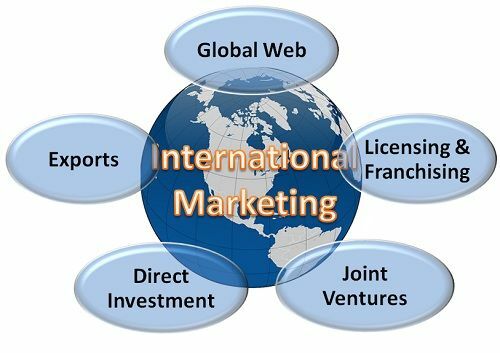 Definition: The International Marketing is the application of marketing principles to satisfy the varied needs and wants of different people residing across the national borders. Simply, the International Marketing is to undertake the marketing activities in more than one nation. It is often called as Global Marketing, i.e. designing the marketing mix (viz. Product, price, place, promotion) worldwide and customizing it according to the preferences of different nation people. The foremost decision that any company has to make is whether to go international or not, the company may not want to globalize because of its huge market share in the domestic market and do not want to learn the new laws and rules of the international market. How to Enter the International Market? Exports: The easiest way to enter the market is through exports that can be indirect or direct. In Indirect Exports, the trading companies are involved that facilitates the buying and selling of goods and services abroad, on the behalf of the companies. Through Overseas sales branch, that carries out the promotional activities and facilitates sales and distribution. Global web Strategy: Nowadays, companies need not go to the international trade shows to show their products, they can very well create the awareness among the customers worldwide through an electronic media i.e. internet.Through the company website, customers can read the detailed information, generally written in different languages, about the product and can order online. Licensing and Franchising: One of the ways to globalize is through licensing, wherein the domestic company issues the license to the foreign company to use the manufacturing process trademark, patent, name of the domestic company while facilitating the sales. In licensing, the domestic company has a less control over the licensee. But, in the case of franchising, the domestic company enjoys the higher control as it allows the franchise to function on its behalf, and in line with the terms and conditions of the domestic company. MC Donalds, Dominos are the examples of franchising. Joint Ventures: The companies can go international by joining hands with other country based companies with the intention to monetize their existing relationships with the local customers.In India, TATA AIG, HDFC standard life insurance, TATA Sky are the examples of joint ventures. Direct Investment: Ultimately, the firms can establish their own business facilities or own a part of the local company to facilitate the sale of goods and services. The companies go international with the objective to have an increased sales along with the huge market share. But certain things such as political, social, technological, cultural situations should be kept in mind while designing the marketing principles since these are different for the different nations. really helpful, linked concepts too. Good information about international marketing. I am very happy with the model illustrating what International marketing is all about. This is my first time I am coming across this as a teacher who is not in core marketing area. Good work. Thanks for sharing such helpful presentation of what is international marketing. I am very thanks for sharing such helful presentation about International marketing.